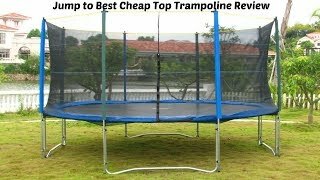 Outdoor Trampoline exercises are dependant on the size of your trampoline. Large outdoor trampolines are best enjoyed outdoors in the fresh air, with 10 minutes of vigorous jumping, providing benefits to physical and mental health. At the same time, why not turn on some music and jump, twist and dance. Depending on your cardiovascular condition, don't push yourself too far, too early. Start off with short exercise routines, possibly 5-7 minutes on your trampoline and gradually build your stamina and endurance. Stand on the trampoline with your feet about shoulder-width apart. Without lifting your heels or toes from the trampoline, gently use the spring of the trampoline pad to move up and down. This exercise routine is not strenuous and will not make you short of breath, but requires muscle exertion and coordination. Continue for as long as you wish for maximum benefit. This is a great exercise, which provides general toning throughout your muscles and helps clean toxins from your lymphatic system. In this routine, you would spring from the center of the outdoor trampoline in one movement, lifting your feet from the trampoline at the same time each time you jump. This is a very popular exercise routine amongst athletes because of its overall toning properties. This is a very fun exercise and strenuous exercise. At the top of the jump, your body will hover motionless for a split second. At this point, you can introduce dance moves, such as twist and shape yourself to the groove of the music. If you have a favorite dance routine, introduce an element to each of the music tunes. This will allow you to focus on areas of your body you want to improve. This is an excellent jogging routine. Stand at the center of the outdoor trampoline, start with a gentle warm-up. Gradually, turn elevate to a vertical spring, then start to jog. Lift your knees as high as you can with each step, to really open your lungs and cells to increase oxygen intake. Keep this routine up for 3 minutes, then drop back to the Vertical Elevation and wind down to the Warm-Up routine.